Also serving communities of Atwater, Los Banos, Mariposa. There are 17 Assisted Living Facilities in the Merced area, with 6 in Merced and 11 nearby. The average cost of assisted living in Merced is $2,600 per month. This is lower than the national median of $3,346. To help you with your search, browse the 71 reviews below for assisted living facilities in Merced. On average, consumers rate assisted living in Merced 4.2 out of 5 stars. Better rated regions include Turlock with an average rating of 4.3 out of 5 stars. Caring.com has helped 7 families in Merced find high-quality senior care. 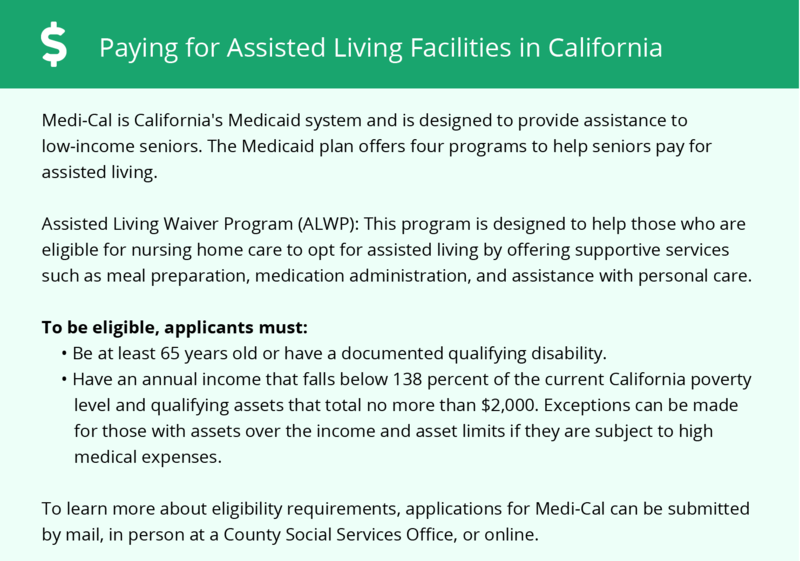 To speak with one of our Family Advisors about assisted living options and costs in Merced, call (855) 863-8283. The mid-sized city of Merced, California, is southeast of San Francisco and boasts many attractions year round. Seniors can marvel at the MERCO Cycling Classic, Merced Antique Fly-In, The Big Valley Arts & Culture Festival, and the Central Valley Blues Festival. Assisted living facilities in Merced, California are classified by the state as residential care facilities. In these communities, residents receive assistance with the tasks of daily living, and they often receive help with medication management. Out of the 16 communities in the city of Merced and the surrounding area, five of those are within city limits, while the remaining 11 dot the landscape of neighboring communities, including Turlock, Madera, Modesto, Oakdale, Salida and Escalon. For seniors who live in the Merced city limits, a bright spot is the lack of tax on Social Security benefits in California. This situation can help seniors afford living in the state. The city's climate is appealing for seniors who enjoy warm weather with plenty of sun and little rain. In winter the city usually has no snowfall, with an average January low of 38 degrees Fahrenheit. The summers are hot and sunny, with an average July high of 95 degrees Fahrenheit. The Merced area is home to world-class medical facilities, including the Mercy Medical Center, Mercy General Hospital and Mercy UC Davis Cancer Center, in the event of medical emergencies or illness. The cost of living is a bright side of the city, with a score only 1.1 points higher than the national average. Groceries, housing and miscellaneous costs all are about equal to the U.S. average, while health and transportation are seven and six points higher, respectively. The monthly cost of residing in an assisted living facility in Merced is equal to the national average of $3,750. Air quality in Merced is quite poor, with an F grade. It has 92 orange days and five red days per year. Seniors with respiratory ailments could suffer serious problems throughout the year when engaging in outdoor activities. Crime in the city is a severe problem, with more than twice the national average of violent crime and property crime that is much more prevalent than the U.S. average. Seniors considering moving into the city should be aware of the areas with higher crime and avoid living in those areas. Assisted Living costs in Merced start around $2,600 per month on average, while the nationwide average cost of assisted living is $4,000 per month, according to the latest figures from Genworth’s Cost of Care Survey. It’s important to note that assisted living rates in Merced and the surrounding suburbs can vary widely based on factors such as location, the level of care needed, apartment size and the types of amenities offered at each community. Seniors who reside in assisted living communities in Merced have two options for additional funding to help with monthly costs related to their residence. 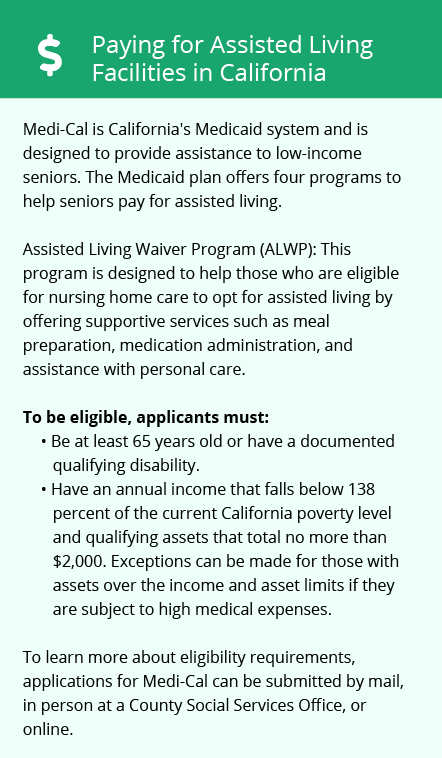 The state provides assistance to these seniors through the Assisted Living Waiver Program. The second option is the Optional State Supplement, which helps seniors who receive SSI to pay for their assisted living costs. Merced and the surrounding area are home to numerous government agencies and non-profit organizations offering help for seniors searching for or currently residing in an assisted living community. These organizations can also provide assistance in a number of other eldercare services such as geriatric care management, elder law advice, estate planning, finding home care and health and wellness programs. To see a list of free assisted living resources in Merced, please visit our Assisted Living in California page. Merced-area assisted living communities must adhere to the comprehensive set of state laws and regulations that all assisted living communities in California are required to follow. Visit our Assisted Living in California page for more information about these laws.